How to obtain circular cardview when height is dynamic? How could I change one attribute of a custom view that has been created before? How to move an object , with a shape seen in the background scene? I have tried this, but it curves just the corners. <?xml version="1.0" encoding="utf-8"?> <shape xmlns:android="http://schemas.android.com/apk/res/android"
I tried to parse the name for testing but could not succeed, I'm need to python. You basically define radius as being half of CardView height. But would you make circular cardview when you don't know height? In below case for example. I just want to make a circular CardView when I have match_parent as my CardView width and height, but somehow don't know how to achieve it. Any suggestions? 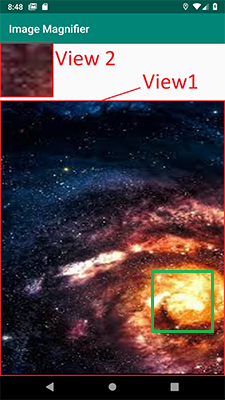 I am trying to magnify a part of an image from an ImageView by touching and movig fingers on screen and attach it to another ImageView as it follows in the picture. I created a class by which I can magnify but Unfortunately I don't know how to attach it in another ImageView. I know I have to crop a specific part of the source image and then attach it to another ImageView. I would appreciate if you help me to solve this problem. Thanks in Advance. I have checked these post but I couldn't find my answer. How to show zoomable/ magnifying part of imageview into another imageview like flipkart? I have a class that creates Custom Views. I called them Plant Views. Each of them have these attributes : Name, degree, info and image. I would like to change the info text of the one that has for name : "Test" for example, after a click on a button from an other class. I tried to set Tags to these custom Views but I haven't really understood how it works. * Constructeur de la classe. * @param attrs   the attributes from the layout. * @param context      the context. * @param attrs        the attributes from the layout. * @param defStyleAttr the attributes from the default style. How can one set image from uri to the background of custom view without causing the stackoverflow error. As I couldn't find any appropriate answers, I hope to find it here. The moving object (say a box or a circle) should follow the shape around with user finger until the time runs out. For example ,there is a moving path seen to the user on the screen then he will have to cross the path by moving finger along with the path . I am able to rotate an image. This works great. However, I want to be able to extraxt the Shape/Polygon of the result image so that I can use it to capture a mouse event when the mouse moves over the rotated image.